Residents and tourists of Baguio City are in for another fun adventure as SM Prime Holdings, Inc. (SMPHI) opened an amusement park last November 8, 2018. Sky Ranch Baguio, located in Luneta Hill, Upper Session Road, is the newest go-to spot for locals and vacationers alike looking for fun, adventure and excitement. In partnership with international and local amusement ride operators, the park is home to a mix of family, kiddie and thrill rides as well as challenging games set within verdant surroundings in a 5,500 square meter land beside SM City Baguio. Sky Ranch opened with 12 rides including the Super Viking, Drop Tower, Carousel, Sky Cruiser, and Baguio Eye. The Super Viking is a giant boat ride that goes back and forth and swings up to 90 degrees which urges every rider to fill the air with screams and giggles, while the Drop Tower makes big time surprises with sudden drops and fall. Both rides are perfect for thrill seekers. The park also features a Carousel that moves up, down, and around while letting riders appreciate the ornate design of the classic attraction. The Sky Cruiser ride, on the other hand, makes riders go into the woods while pedaling their way around a track set between pine trees. The towering Baguio Eye which rises about 50 meters tall and 45 meters in diameter really catches everyone’s attention especially during the night as it rotates with running colorfulights. It is composed of 24 air-conditioned gondolas, with each gondola big enough for four people. 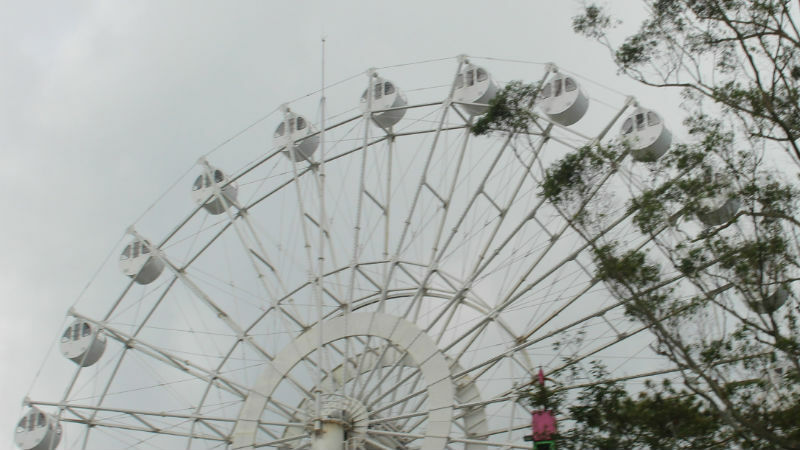 Aside from these rides, Sky Ranch Baguio also offers fun games fit for all ages. Visitors can play games like basketball, ring toss, hang man, hook a duck, stick a card, and lobster pot. Lucky players can take home stuffed toys and other awesome prizes. Sky Ranch Baguio is open from Monday to Sunday from 10 AM to 10 PM. Entrance fee is P80 from Monday to Thursday and P100 from Friday to Sunday and holidays. Prices of the rides range from P50 to P150.